This case study looks at how bayt.com, a West Asian job portal, emerged as the leading job portal of the region. The company used this newly found respect to negotiate relationships whereby it became the job site for various partners. The partners were primarily portals interested in driving and maintaining traffic to sell online advertising. On the other hand, bayt.com was primarily interested in getting as many rÃ©sumÃ©s as possible so it could monetise them from employers. The portal approached its partners with the argument that having a job section on their sites would drive more traffic to them and, therefore, more page impressions they could monetise through advertising. For bayt.com, it ensured that every time a jobseeker visited any of West Asia's leading sites he/she was exposed to the job portal. It encouraged people to build a rÃ©sumÃ© on it. The strategy worked wonderfully. At practically no cost, a significant amount of registrations came onto the portal. The initial hurdle of establishing credibility had been overcome and now bayt.com moved on to establishing itself as the leading job site in West Asia, winning several industry awards along the way. 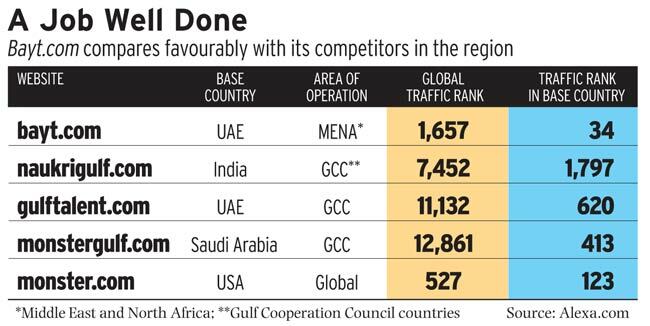 In just13 years, it has grown exponentially and is ranked as the number one job site in West Asia and North Africa. It has expanded to provide end-to-end employment solutions, career planning tools and is now available in three languages. Choice: The sheer size of the database gives employers a choice they never got before in the region. Rabea Ataya, CEO and co-founder of bayt.com, compared the company's model to a shopping mall where the shoppers are the jobseekers and the renters are the employers. The more shops there are, the more shoppers you get and vice versa. 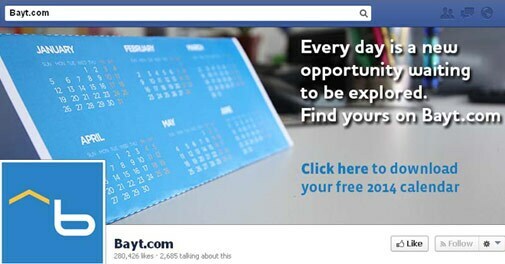 Today, bayt.com has over 12 million rÃ©sumÃ©s and it gets some 5,000 rÃ©sumÃ©s per day. Speed and ease: The technology is so efficient and convenient that human resources departments do not have to filter rÃ©sumÃ©s anymore. Earlier, they had to go through reams of rÃ©sumÃ©s to shortlist candidates. Employers can now search through candidates' profiles, gauge their knowledge on relevant topics, and evaluate specific skills and the fit for the position. The traditional method of hiring through a recruitment agency could take 90 days or even longer. This has been considerably reduced with bayt.com's customised search options for employers and jobseekers. Additionally, jobseekers can pay extra to feature their profiles for a specific organisation, thereby shortening the hiring process timeline for both segments. The speed and ease with which employers and jobseekers are able to navigate the site has led to seven million visitors per month on bayt.com. The company offers a strong value proposition to advertisers as well. It provides better rÃ©sumÃ© targeting than any other medium in the region. Any company advertising with bayt.com can monitor and adjust its ad campaign in almost real time. The portal also offers a more cost-effective solution when compared with traditional and other online media. Most employers at some point need to decide whether they should build an in-house recruitment platform or partner with technology providers such as bayt.com and host a co-branded and integrated careers portal with a back-end platform hosted by the technology provider. Bayt.com calls this a 'white label' strategy. It offers its recruitment platform under the title "Careers Sites" and is used by many private and government organisations. This allows jobseekers to access the employer platform, which is in turn routed to bayt.com. Additionally, it helps employers to upscale their image as a modern company with a professional and user-friendly online career portal to attract and retain top talent. The benefits of this strategy include converting visitors into potential candidates at much lower costs and minimal time by filtering rÃ©sumÃ©s and interacting with only relevant candidates.